Context: Eleanor Oliphant suffered a childhood tragedy and was put in the foster care system. An adult now, she lacks appropriate social skills and lives more or less in isolation. But she has a thing for a musician who she thinks can open up new avenues for her. In the meanwhile, there’s a funeral to go to and Eleanor realises that social occasions require one to alter oneself a little. I was getting the hang of this shopping business. I had returned to the same department store and, after seeking advice from a different shop assistant, had purchased a black dress, black tights and black shoes. This was my first dress since childhood, and it felt strange to have my legs on public display. She had tried to steer me toward vertiginous heels again--why are these people so incredibly keen on crippling their female customers? I began to wonder if cobblers and chiropractors had established some fiendish cartel. On reflection, though, she was correct in stating that the fitted black dress did not really "go" with either my new boots (too informal, apparently) or my Velcro work shoes (it appeared that nothing did, much to my surprise; I had thought that they were the very definition of versatility). We compromised with some improbably named "kitten heels," which, contrary to what one might think, had nothing to do with cats. They were heels which were easy to walk in, but which were, nonetheless "very feminine." On what basis was this decided, and by whom? Did it matter? I made a mental note to research gender politics and gender identity at some point. There would be a book about it--there were books about everything. On this trip, I'd even bought a handbag, judging that my shopper probably wouldn't be appropriate for a funeral. The fabric was imprinted with a very jaunty pattern, and I felt it might stand out at a graveside. The wheels could also be a bit squeaky. The bag I finally settled on was impractical, being far too small to carry, for example, either a hardback book or a bottle of Glen's. I examined it when I got home, stroking its glossy leather outer and silky fabric lining. It had a long gold chain which you simply placed over your shoulder, leaving your hands free. At further horrendous expense, I'd also bought a black wool coat, single-breasted, knee-length, fitted. It was warm and plain, characteristics that I found attractive. Looking at all my purchases, spread across my bed for closer examination, I assuaged my concerns about the cost by reassuring myself that the entire outfit could be worn again and again, either together or separately. I now owned what I believed was called a "capsule wardrobe," clothes which were appropriate for most social events that the musician and I might attend together. I'd look right in them, on his arm. An evening at the ballet, perhaps? The opening night of a new play? I knew he'd be opening up uncharted worlds for me. At least now I had the appropriate shoes for them. I'd spent more in these last few weeks than I usually spent in a year. Social interaction, it appeared, was surprisingly expensive--the travel, the clothes, the drinks, the lunches, the gifts. Sometimes it evened out in the end--like with the drinks--but, I was finding out, more often than not, one incurred a net financial loss. I'd a bit of money saved up, but it only amounted to a month's wages or so, and Bob's paychecks were far from generous. I saw now that this had only been possible because I hadn't had much requirement to spend money on the social aspects of life before now. Mummy liked to live extravagantly, but after . . . everything changed . . . I'd learned that money was something to worry about, to ration. It had to be asked for, and then counted out into my red raw hands. I never forgot--was never allowed to forget--that someone else was paying for my clothes, the food I ate, even for the heating in the room where I slept. My foster carers received an allowance for looking after me, and I was always conscious of making sure not to cause them to exceed it by needing things. And especially not by wanting things. "Allowance" is not a generous, lavish word. I earn my own money now, of course, but I have to be careful with it. Budgeting is a skill, and a very useful one at that--after all, if I were to run out of funds, find myself indebted, there is no one, not a single soul, on whom I could call to bail me out. I'd be destitute. I have no anonymous benefactor to pay my rent, no family members or friends who could kindly lend me the money to replace a broken vacuum cleaner or pay the gas bill until I could return the borrowed sum to them on payday. It was important that I did not allow myself to forget that. Nevertheless, I couldn't attend Sammy's funeral in inappropriate clothing. The black dress, the assistant assured me, was smart, but could also be "dressed down." The coat could be worn all winter. My jerkin had more than paid for itself over the years, but I would keep it, of course, in case it was required again in future. I hung everything up carefully. I was ready. Bring out your dead. 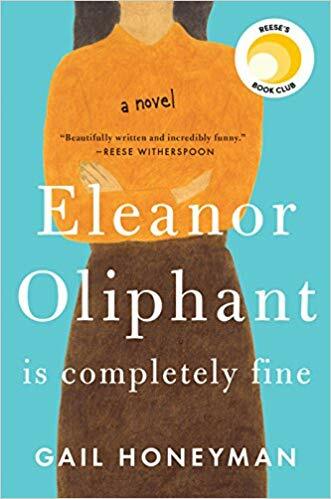 Eleanor Oliphant Is Completely Fine is the smart, warm, and uplifting story of an out-of-the-ordinary heroine whose deadpan weirdness and unconscious wit make for an irresistible journey as she realizes the only way to survive is to open your heart.